The China-proposed Belt and Road Initiative has paved the way for new opportunities for Nepal to realize its dream of development and economic prosperity, government officials and experts said here on Monday. 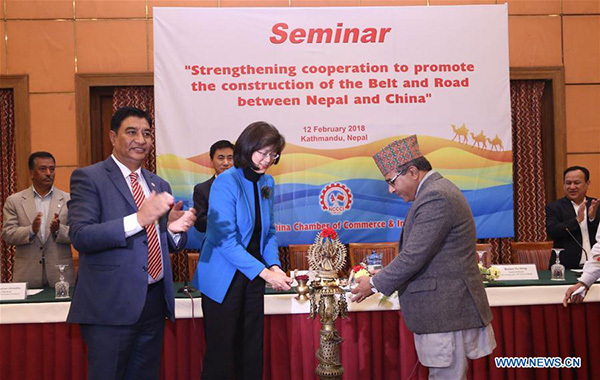 They made such remarks during a one-day seminar entitled "Strengthening cooperation to promote the construction of the Belt and Road" organized by Nepal China Chamber of Commerce and Industry (NCCCI) in Kathmandu. Stating that the Belt and Road Initiative will bring opportunities in multiple fields including trade, connectivity, physical infrastructure development, tourism and investment, they pointed out the need of concrete mechanism for implementation. "We have chalked out strategies and plans to implement the initiative but I believe Belt and Road Initiative is a much broader concept. We should have three tracks of approach, including the government one, business to business approach including private sector and knowledge-based approach to gain maximum benefits," Shanker Das Bairagi, Secretary at Ministry of Foreign Affairs, said after inaugurating the event. Stressing that Nepal is a land-locked and least development country, the foreign secretary said that it needs the cooperation of neighbors, especially China, to upgrade its status to a developing country. Nepal and China had signed a Memorandum of Understanding on Belt and Road Initiative on May 2017 in Kathmandu. Introduced by China in 2013, the Belt and Road Initiative aims to build a trade and infrastructure network connecting Asia with Europe and Africa along the ancient trade routes of Silk Road. Addressing the function, Chinese Ambassador to Nepal Yu Hong said that development of the Belt and Road Initiative needs sincerity and resolution and the vision of all parties. "China is willing to work closely with Nepal to seize the historical chance to develop concrete cooperation under the framework of the Belt and Road Initiative and bring China-Nepal relations to a new height," Yu said. On the occasion, she pointed out various points to enhance the cooperation, namely strengthening policy coordination and consolidate mutual trust, expanding connectivity and sharing experience for economic development, promoting the unimpeded trade, deepening the financial integration and constructing the road for innovation, strengthening the people-to-people bond for mutual learning. Experts were of view that there is a need of sincerity and political commitment for the implementation of the initiative from the Nepali side. They pointed out that Nepal's government should focus on some basic pre-requisites like connectivity, infrastructure development, reforms in laws, and policy amendments among others. Dr Rajesh Kazi Shrestha, President of Nepal China Chamber of Commerce and Industry, said, "We are eager to welcome investment under the Belt and Road Initiative in various possible sectors like hydropower, agriculture, trade related infrastructure, tourism, herbs and herbal products, natural resources and service sectors." Nearly 100 experts from different countries, investors, traders and business community members attended the one-day seminar.